Within your workshops, GesPack helps you to optimize and plan the best as possible your productions. Monitoring your conversion machines and your corrugators, updating your stocks, it gives you access to all the tools you need to calculate and optimize your actual production costs. 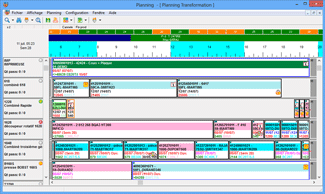 The planning automates your orders and allows you to organize your production to meet your deadlines. Communicating with your stock, it will prevent your plant from supply shortage. 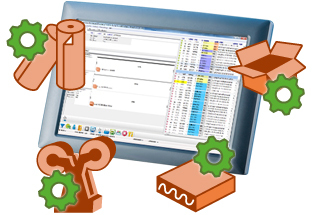 You can quickly have a view on your machines and their orders, you can easily change the organization with your mouse, you have a good global view through the zoom functions, your workshops’ planning becomes very easy. Your production times are calculated, your deadlines are under control, your efficiency is optimized. Palletization, corrugator options, conversion operations, associated printing forms, relaunch of additional products… Our system adapts itself to the commercial and technical requirements of the production process. Each one of those three main activities of a cardboard factory (papermaker, corrugator and converter) is granted with a package of applications adapted to its specificities. By specializing our software package, we allow you to work in the optimal conditions you need. The planning orders are transferred directly to the monitoring apllication, which allows you to control directly your machines according to the orders without losing time with the data entry. The settings are automated to avoid time loss, the sales service is informed in real time of the orders progress, consequently your reactivity is boosted. The operation of the supervisor, designed for touch screens, can communicate with all kinds of corrugators or conversion machines, and gives you many useful data on your production result. The traceability of your production, through the workshop monitoring, allows you to study its course and to draw conclusions. Your machines drivers can receive automatic reports. Those ones are analyzed in order to make an assessment to improve your production capacities and quality. The three main parts (papermaker, corrugator and conversion) allows you to to manage your machines according to the requested specificities of your business. Your machines management, all in one application, will increase your efficiency and help you to have a better visibility thanks to the actions and the data stored in one place. The continuous connection with your stocks allows you to manage their evolution as close as possible to the reality. Supply shortages are anticipated. Your sales service has constant access to all the reliable data it needs to inform the customers on their orders’ status. 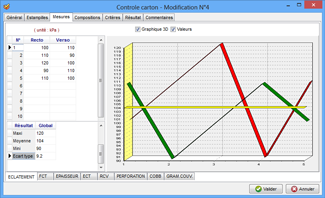 You monitor your machines, you control your stocks, you automate your orders and improve your production quality. These are the advantages to work with interconnected modules.